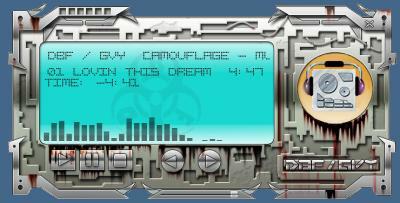 Camouflage - Music Disk from Gravity / Dark Bit Factory. This is our entry and 1st prize position in Adigun A. Polack's wicked music disk compo. Feel free to Pop along to the DBF / GVY forums, if Gfx Demos / effects and the like are your bag, we'd love to see you there. Cool, at least it's got some views. Wow, I find that very impressive. those musical pieces DBF's own creations? If so, even better. Yep all original work dude by Gravity And Dark Bit Factory. Feel free to pop over to the site matey. sweet, other than a lack of a minimize button, its awesome, nice job. edit: any chance of making it so it can play other files, ex mp3, ogg so that I could use this instead of wmp or something? It would not be too difficult to load your own selection of tunes into it. Thanks Deleter, and hope the source is of use for your needs.